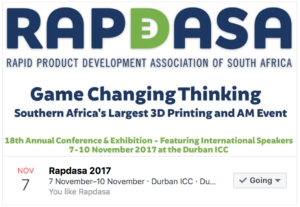 Meet Materialise at the 18th RAPDASA conference hosted by Rapid3D and taking place at Inkosi Albert Luthuli International Convention Centre. We would like to welcome you to our Materialise exhibition area to find out all about 3D Printing Software. Find out more about our software suite that streamlines the 3D printing flow from design to printed part. The RAPDASA conference will bring together the leading innovators and entrepreneurs in Additive Manufacturing in South Africa. If you would like to book a meeting with Paula Magalhães, please contact Despoina Sfyraki to set up an appointment.